#48: Seventy Two Hours, Part 1 (of 3) | DC2: New Adventures of DC's Heroes! Deep inside the belly of the Fortress of Solitude, Kara Zor-El tentatively walked up the stairs leading to the departure platform. “How long until they arrive?” she asked, looking down. “A few minutes, if that,” came Kal-El’s reply, as he followed, carrying her conspicuously light suitcase. She looked up and saw fragments of crystal reflect her concerned expression back at herself, but she knew that it was just nerves-- there wasn’t anything to be worried about. The air was full of static, which her cousin informed her was perfectly normal, but it caused her hair to begin to drift upwards of its own accord, undoing any sense of style she’d tried to impart upon it prior to her exodus. “Are you okay? Feeling a bit nervous?” asked Kal. Kaleidoscopic lightning fluctuated from inside the invisible folds of reality as they became visible, and a shape began to materialise-- the Legion of Super-Heroes’ Time Sphere was beginning to solidify in the present day! The Time Sphere finally manifested completely, and inside the futuristic time machine Kal could see Brainiac 5, Lightning Lad and Saturn Girl. The latter pair waved enthusiastically, while the former glanced up from the controls and gave a curt nod. Never change, Brainy, thought Superman. “Is that… a Brainiac?” asked Kara. “Querl isn’t so bad once you get to know him!” exclaimed Saturn Girl cheerfully, as she stepped out of the time ship. “C’mon, that’s not saying much,” retorted Lightning Lad, following close after her. “You haven’t changed one bit,” said Superman, embracing the pair of them tightly. “ooof, Sprock, did you get stronger?” asked Lightning Lad, feigning being winded. “Sure, I guess,” said Kara. She wasn’t convincing. “We need to get moving. I’m reading a tachyon crest headed toward this timeframe. I don’t want to be here when it hits,” said Brainiac 5, popping his head out of the Time Sphere. With Saturn Girl laughing and shaking her head, Supergirl followed the pair of Legionaries into the Time Sphere, and then waved at Superman meekly as Brainiac 5 worked the controls. Kal returned the gesture with a broad smile, and then felt the air energise as the time vessel faded from view. The four of them had vanished, travelled from their current timeline into one located a thousand years into the future, and leaving the Fortress of Solitude hanging in an eerie silence-- that was only broken when the kaleidoscopic lightning returned with a vengeance! “What in God’s na--?” started Superman, but he was interrupted when time and space abruptly folded in on itself, and then, with the air suddenly smoking, there was an explosion of concussive energy that sent him flying backwards-- though he caught himself before he smashed through the crystal shards that made up this section of the Fortress of Solitude’s interior. “That smarted…” He mumbled, before he saw what now occupied the departure platform. “Ooph, I wasn’t expecting that… she... she really needs to work on her definition of ‘plain-sailing’…” came a familiar voice from inside the ship. “Hello? Who’s in there?” Kal asked. He squinted, focusing his vision, but the tachyon aura around the ship caused his attempts to peer through the thick veil to fail. But even as he tried, the roiling mist cleared as a woman emerged, clad in a familiar yet different costume. Kara Zor-El, clearly older, her hair shorter and her eyes bright and full of life, rushed over to her cousin and embraced him, lifting him off his feet. “Kara… what happened to you?” he asked. Kelex buzzed around the older Kara Zor-El, taking readings and analysing her cellular structure. She was stood on a circular platform, lights drifting down from the scanner array above her head, and she was currently enjoying the way the shafts of light were reflecting on the helper droid’s golden chassis. “Don’t worry, Kal. I get it,” she replied, closing her eyes and enjoying the sensation of light dancing across her skin. He considered her face, the slight smile on her lips, and hoped that this was his cousin, because she looked so happy, and that’s all he ever wanted for his younger cousin. “And your birthday…” started Kal. It was another test, and by her smirk, she could clearly tell. With no reason to argue, and the Fortress of Solitude confirming this strange visitor’s identity, the pair exited the crystalline alien palace and headed up into the skies, moving north until they were over the Indian Ocean. They travelled in silence, Kal watching Kara smile and laugh as she skimmed her hand across the ocean and marvelled at the sights before her. “You’re listening to the background noise? All of it?” Kal asked. The pair blitzed across the skies, and within a matter of seconds had arrived in Metropolis, navigating some four thousand miles in the time it took some drivers to manoeuvre out their garages. Superwoman did a quick lap of the Daily Planet’s globe, landing on the roof of the metropolitan newspaper’s headquarters as Superman caught up with her. “You let me win,” she replied, chuckling. When Krypton and her denizens perished thanks to the machinations of General Zod-- if you didn’t know the centuries-spanning legend of Superman-- you might have thought that would be the end of it. Long dead, her population wary of interstellar travel and therefore never having really explored the depths of space surrounding them, billions died deep in the void, and that… should have been that. …And for some, it came. The cruel General Zod, his beloved Faora and the corrupted Kru-El found a crack in the membranes of reality and made their exit from the confines of the Phantom Zone, then attempted to exert their will on Earth… but Superman stood victorious against the odds, and that… should have been that. …Who knew what would happen? “What do you know of Brainiac?” Superwoman asked, her eyes slits as she surveyed the skyline, searching for something she hadn’t explained to her cousin. “That’s the Galaxy Communications Building,” said Superman. “You’re losing me,” said Superman. “I didn’t know…” Kal admitted. Superman nodded. Thoughts rushed through his mind, but he dismissed them-- he was with his cousin, after all. They leaped forward-- and landed inside the board room of Galaxy Communications, where Morgan Edge was currently holding court with his senior staff. “What is the meaning of this?” bellowed the CEO. “Alien presence?! You’re the only alien presence I can see! That we can all see!” declared Morgan, interrupting the Man of Tomorrow mid-sentence. “Uh, Mister Edge, should we--?” started Josh Coyle, one of the senior producers. “I won’t let that happen again,” said Superman. “Wh-what are you going on about?” said Morgan, as Coyle beckoned a camera crew into the room. Cindy Miles, WGBS’ on-the-spot reporter, had her hair quickly prepared as the crew started rolling. Superman’s ears picked up hurried chatter downstairs in the newsroom, where the news was about to cut to the camera feed being relayed from the boardroom. She breathed in, then stuck two fingers between her lips and whistled at a pitch that none of the humans gathered could hear, though Superman felt the hairs on the back of his neck rise up, and Morgan Edge cried out as sparks flew from his mouth, and smoke blew from his ears. He collapsed backwards, twitching uncontrollably, and then the entire building began to rumble. “What did you do?” Superman asked. <This Does Not Compute--> bellowed a voice across the building’s intercom. A massive, skeletal face pushed out of the wall directly in front of the gathered men and women, with three signature discs embedded across its forehead. “Hello, Brainiac. I’m Superwoman. I’m from the future. And you? You deserve everything that’s about to come your way,” said Superwoman, cracking her knuckles. Cindy looked at Josh, who looked at the cameraman, who was levelling his camera on Superman as they all listened to the grating, tinny voice booming out of the wall and throughout the structure, and then, a split-second later, all of Galaxy’s employees were stood out on the streets surrounding the building, the Els working in tandem to clear any possible innocent life from the line of fire. “I feel like we should have discussed a plan before we jumped into this situation,” said Superman, looking up at ap Galaxy Communications Building as it shook violently. Sirens began to blare as the Metropolis Special Crimes Unit approached, but the pair of Kryptonians were already floating upward, heading back to the danger they'd uncovered. “And punch it in the face?” asked Superwoman. The pair dove back into the building, and Superman followed Superwoman as the face that had formed moments before rippled across the walls and into the ceiling, until it ended up in Edge’s office, where a body was hastily being constructed from stray parts that appeared out the floor, the walls, the desk… wet chunks of metallic substances were melding with fleshy slabs of meat, combining into what the pair assumed to be a new host avatar for Brainiac! “Well, that’s disgusting,” said Superwoman. “Explains why Edge vanished without a trace in the future,” mused Superwoman. “Then why the crusade against the superhero community?” pushed Superman. “Rao, I get it,” said Superwoman. “--Whoa! The walls just became energized, there’s a massive build-up--” said Superman, his eyes flashing. “--Then we can--” he added. Within a matter of seconds, they’d yanked the entirety of the Galaxy Communications Building from its moorings on the streets of Metropolis and lifted it up into the air. Waves of energy warped the air around the structure, and as soon as it was disconnected, alien technology was exposed beneath the concrete! The pair flew-- up, up and away-- into the skies, through the atmosphere, and into space, where they threw the GCB away from the Earth and toward the sun, where it detonated harmlessly away from the planet. “You’re going to see Ma?” Clark said, his taking on a hushed tone so nobody nearby could overhear. “I mean… that much makes sense. I’ll give her a call though, just let her know you’re coming. And who you are,” he replied. “We just kicked Brainiac in the teeth! Of course I’m okay!” she replied, beaming as she exited the scene. Karen Starr had another name, one she barely used anymore. 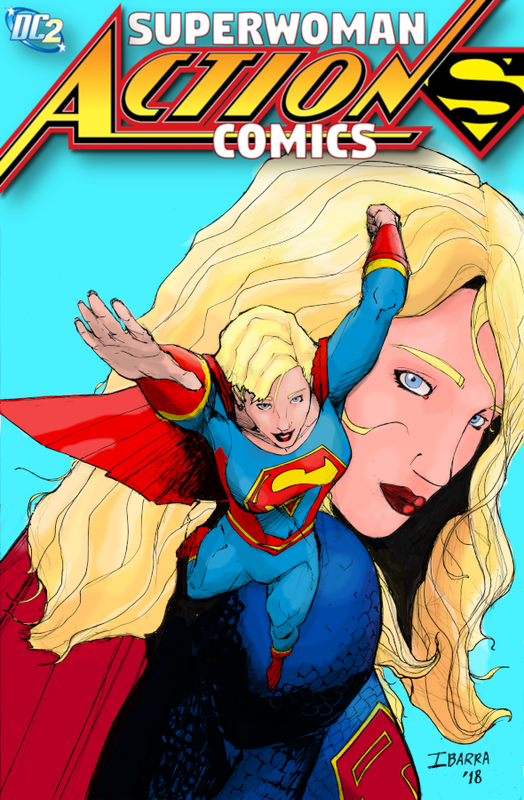 Kara Zor-L to be precise, the Last Daughter of a Krypton that died a parallel world away… in Reality-2. But through a cosmic twist of fate, she’d been marooned on this world-- Earth-1-- and her vibrational signature had shifted so that she couldn’t remain in the universe that was her home*. *As of Justice Society of America #7-12 & Annual #1, "Crisis on Two Earths!" She tried not to think about it. “Usual deal. Time travel, visiting old haunts, seeing friends, family,” replied Superwoman, as she climbed inside. “Whoa. You… look a hell of a lot like me,” said Karen, taking in her visitor. “I mean, my birthday is on Monday…” said Karen. “Twenty-seven…” she added, with a groan. Kara grinned. “I’m organising a dinner, and I happen to know you have no plans tonight." Superwoman smiled, and almost laughing, replied, "I asked you. Twelve years in the future. Thing is, Karen... you're kinda my biggest, bestest sister where-- when-- I come from. And it wouldn't be right to have a family get together without my fave." Karen blinked. Earth-2 may not have been readily accessible, but this woman in front of her, spitting image that she was, exuded the kind of familial aura that she'd sensed when meeting the Kal-L of that world, whom she'd only seen sporadically since their discovery of each other's existence. He'd thought her lost, she'd lost her memories of her life before Earth-1, but just being in each other's presence... there was an energy to that, and she could feel that again, radiating between this 'Superwoman' and herself. This may be the past, but Kara Zor-El was warmed by the fact that somethings-- like her relationship with her ‘older sister’ from another universe-- didn’t change. “So she’s your cousin… but from the future?” said Lois Lane, incredulously. It was the early evening, and they’d flown from Metropolis to Smallville slow enough to enjoy the trip, but fast and subtle enough to avoid detection by any number of the tracking systems that might wonder what a blip on the radar the shape of a man was doing zipping from state to state. “You told her about the future?” said Clark, looking over at Kara. “Maybe a bit,” replied Kara, shouting from the kitchen. “Yeah, Supes. She knows what she’s doing,” chirped up Kon-El, sat on the coach and drinking a soda while cartoons played on the muted television. He surveyed the scene. Kon was right at home, while Kara and Karen were zipping around the kitchen, making dinner. Lois and Martha were chatting, catching up since the last time they’d spent time together, and Clark… Clark was happy. This was his family. Stretched from one point of the timeline to another and spread across two realities, sure, but family none the less. When was the last time they were together? For the sake of being together? “So, what’s for dinner?” he asked. At superspeed and with a pair of deft, culinary hands, Kara and Karen had rustled up a feast, and it was yet another sign that the former was who she said she was-- Martha wouldn’t trust her kitchen to just anybody, after all. “How are things in New York, Karen?” asked Martha, taking a sip from her glass of wine. “Oh, you know. The Justice Society keeps me busy, and I don’t have much time for anything else,” she replied. “That’s a terrible shame,” said Martha. And untrue, Kara knew. She had spent ten years with Karen in her life, as a mentor, a sister, and she knew her like she knew herself. There was a time, and she’d been through it herself, when she didn’t want a life beyond what she had, because that would mean opening herself up to the world. “All work and no play…” said Kon. “Don’t talk with your mouth full, Conner,” said Martha. “You’ll find the time, Karen. I know that much,” said Kara. “Hey now, I know you’re being a bit of a spoil sport for the rest of the room, but you needn’t worry about me. I don’t need to know my future to put my best foot forward,” said Power Girl. “So, why are you here?” Lois asked, pointing her fork in Superwoman’s general direction. “…Because I’m not around in yours?” said Clark. Wordlessly, Martha reached across the table and placed her hand over her soon-to-be daughter-in-law’s. “Uh, are you sure we should be having this conversation?” asked Power Girl. “Oh, I think you’re excused, given the circumstances,” murmured Martha. “I don’t know what to say…” Clark said. “You don’t have anything to prove to me, Kara,” said Clark. He smiled and looked over at Lois, who was still processing what Kara had said. He didn’t mention it, because he didn’t want to embarrass his cousin-from-the-future, but he had noticed a subtle spike in her heart rate when she mentioned her girlfriend, and he didn’t think it was because she was worried he would be judgemental. It was the rat-a-tat-tat of someone hiding something, and he didn’t know exactly what it was… or why she’d feel the need to hide something from him… but he had to trust that she had her reasons. “That doesn’t stop me from wanting to prove it,” Kara replied. “Do you need a hand with it?” Power Girl asked.